Due to its location in the middle of several seas, Denmark's weather is mild and climate temperate year-round, with western winds blowing warm air across most of the country. Additionally, Denmark's day and night temperatures don't fluctuate that much, so if you're planning to travel to this Nordic country, you won't need to pack separate outfits for day and night activities. Denmark's mean temperature in the coldest month, February, is 32 degrees Fahrenheit (zero degrees Celsius) and in the warmest month of July, it's 63 degrees Fahrenheit (17 degrees Celsius), although wind gusts and shifts in wind direction can drastically change the weather any time of year. Rain in Denmark comes on a regular basis year-round, and there are no truly dry periods, although September through November brings the wettest season. The annual rainfall in Denmark averages 24 inches of precipitation with Copenhagen having an average of 170 rainy days. Copenhagen experiences an oceanic climate, which is quite variable throughout the year. June is the city's sunniest month, whereas July is the warmest, with temperatures around 69 degrees Fahrenheit (21 degrees Celsius). Winter is quite dark, with minimal sunshine, and sometimes extreme amounts of snow—up to 20 inches have fallen during a single 24-hour span. 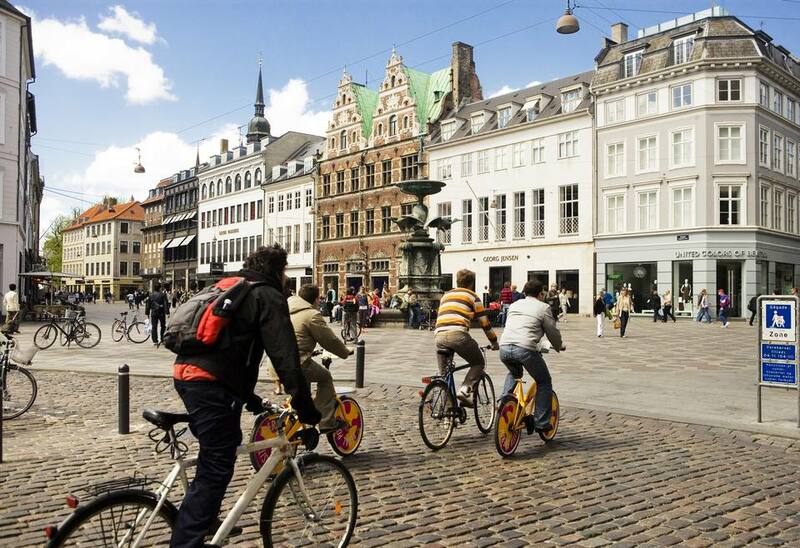 Aarhus is Denmark's second-largest city and experiences a temperate oceanic climate. In general, spring is mild and summer months are warmer. Winter experiences frost and snow frequently, but can sometimes be more temperate than other Danish cities. The city's average temperature throughout the year is 47 degrees Fahrenheit (8 degrees Celsius). Aalborg is cool during much of the year, averaging around 68 degrees Fahrenheit (20 degrees Celsius) during the summer months and 27 degrees Fahrenheit (minus 3 degrees Celsius) during the coldest month of January. October is the city's wettest month, receiving 3 inches of rainfall on average. Odense experiences a climate similar to Denmark's other major cities, with summers reaching up to 68 degrees Fahrenheit (20 degrees Celsius) and winters dropping just below freezing on a regular basis. Unlike some of Denmark's other cities, Odense is subject to extratropical cyclones which result in increased rainfall in both July and August. It is located on a fjord, which must be kept clear by icebreakers during the winter months. Spring months are still cold in Denmark and remain that way through May. On average temperatures dip as low as 50 degrees Fahrenheit (10 degrees Celsius) in April and can creep up above 60 F (16 C) come May. This is also one of the driest seasons to visit. What to pack: A light sweater or jacket is generally appropriate for spring, but you'll want items that you can easily layer on (or take off) as necessary. Summer in Denmark is cool and pleasant, making it a great respite from hot weather. Temperatures rarely exceed 72 degrees Fahrenheit (22 degrees Celsius), with nights being slightly cooler. There are occasional hot days, but in general, summer is a great time to visit. The long daylight hours make it easy to fit in plenty of sight-seeing and outdoor activities. What to pack: Even though it's the warmest time of the year, a sweatshirt, a few sweaters, and a light jacket are still must-packs for Denmark in summer. Quite the opposite of summer, fall in Denmark is dreary, cold, and windy. Daylight hours begin decreasing by September and temperatures drop quickly—it's just 55 degrees Fahrenheit (13 degrees Celsius) in October and 46 F (8 C) by November. What to pack: By the time fall rolls around, you'll want to break out your heavy coat. Waterproof boots or other sturdy footwear is a good idea, too. Average winter temperatures in Denmark hover just above freezing. The sun usually sets by the early afternoon, and it's cold all day. The country's small islands can be slightly warmer but are generally windy. There are often brief cold periods in which temperatures drop below freezing for several days at a time. What to pack: Warm clothes are a must. Your packing list should include a fleece, a down jacket, a hat, gloves, a scarf, a windbreaker, and an umbrella. Because of Denmark's northern location in Europe, the length of the day with sunlight varies greatly depending on the time of year, which is typical for most of Scandinavia. There are short days during the winter with sunrise coming around 8 a.m. and sunset at 3:30 p.m. as well as long summer days with sunrises at 3:30 a.m. and sunsets at 10 p.m.
Additionally, the shortest and longest days of the year are traditionally celebrated in Denmark. The celebration for the shortest day corresponds roughly with Christmas, or "Jul" in Danish, and is also known as the winter solstice. On the other end of the spectrum, the longest day of the year is celebrated in mid-June with a variety of summer solstice festivities including burning witches on bonfires for Saint John's Eve. Chances are if you're traveling to Scandinavia, you will want to see the unique weather occurrence known as the Aurora Borealis (Northern Lights), but if you're visiting Denmark, the season for optimal viewing is much shorter than more northern Scandinavian countries. Although northern Scandinavia enjoys peak polar nights between September and April, southern countries like Denmark experience slightly more light in the months before and after winter, meaning the best time to view this phenomenon is between mid-October and early March. No matter where you are, though, the optimal time of night to view the Aurora Borealis is between 11 p.m. and 2 a.m., though many tourists and Scandinavian residents start their nights around 10 p.m. and end them at 4 a.m. because of the unpredictable nature of its occurrence.